Kickstarter can be a weird, volatile environment. Some projects come and go with little fanfare while others soar into the stratosphere with backer support. There can be all manner of highs, lows and outright trouble for projects on their journey from idea to funding to delivery. That said, four of the projects I wrote about in June wound up successfully funded in the past month. The fifth, the seafaring game Admiral, was funded but the project was then suspended inexplicably with a day to go. No doubt there’s a story there, but for now, here are the projects I’ll be watching as we hit the first hot month of the summer in July. 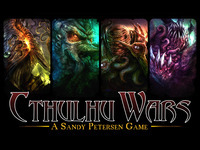 Cthulhu Wars: Drawing on the Cthulhu Mythos of H.P. Lovecraft, this game is the big story in games on Kickstarter right now. With dozens of gorgeously grotesque miniatures and many planned expansions, this strategy board game turns the tables and allows the players to play as Lovecraft’s beastly horde seeking to control the surface of a ruined Earth. Many of the pledgers have bought in at the higher funding levels of $200-500+, no doubt attracted by not only the theme but the tons of extra maps, gaming pieces and figures rewards. The project is trending toward nearly $1 million in funding in its closing days, and the more than 3300 backers are delivering a built-in fan base of this classic horror genre already popular with gamers. 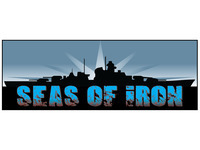 Seas of Iron: I’m not a big naval gaming fan, but I really like the looks of this very modest battleship wargame from Battle Bunker Games. The battleships are comprised of two-sided cards defining the sections of each ship where you deploy your crew and fire volleys at your opponent. When a section is destroyed, cards are flipped over to show that part of your ship aflame. The Kickstarter exclusives include the famed Yamato and Bismarck warships. Just $20 allows for a backer to get a full version of the game which allows enough flexibility for 1-on-1 or small fleet play with combined sets. 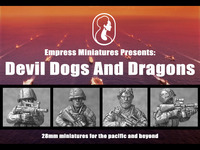 Devil Dogs and Dragons: I’ve invested in more than a few of the Anglo-Zulu War 28mm miniatures from Empress Miniatures. They make quality, spirited and detailed miniatures, so its great to see them expanding their Modern Combat line. There’s a lot of interest in gaming modern warfare right now, and the 28mm scale seems to be a clear favorite with small squad-level engagements in the dusty and hot embattled corners of the world. These 28mm figures fill out modern US Marine Corps and Chinese People’s Liberation Army options for deployment in the Asia-Pacific desert and jungle regions. With a bit more imagination, these guys will even find a home in various zombie, alien invasion or post-apocalyptic scenarios. 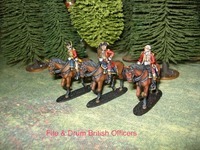 Fife & Drum American Revolution Range: Just in time for the 4th of July weekend, Fife & Drum Miniatures is also expanding their established line of miniatures. Sculpted in a large 30mm or 1/56 scale, these majestic figures offer incredible detail for the Colonial Period ranging from the Seven Years War to the American War of Independence. The Kickstarter campaign will help fund the company’s expansion into new British cavalry, Hessian, Highlander and French infantry offerings. At the $50 level, backers receive a special three-figure “Spirit of ’76” vignette, making this project perfect for any patriot and fan of the AWI period. 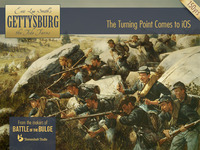 Gettysburg: The Tide Turns: Finally, and in keeping with the theme of American military history, I’m throwing in one video game offering to round out the list. The Battle of Gettysburg is celebrating its 150th anniversary this month, and so this timely iOS game for the iPad and iPhone looks to be a deal at just $10 to back the project. Developed by Shenandoah Studio, the makers of the previously Kickstarted Battle of the Bulge iOS game, this simulation looks to be a very promising 21st-century tribute to the strategy, tactics and heroics found on the famed Pennsylvania battlefield 150 years ago.